Qty.5 1oz. re-usable bottles of clear hand sanitizer with carabiner clip with labels adhered. Our labels are made of high quality, peel and stick waterproof material and eco solvent inks. Ink will not run or bleed and labels will stay adhered to the cigar. Cigar Label Dimensions: 3.25" x 1.2". Cigars not included! 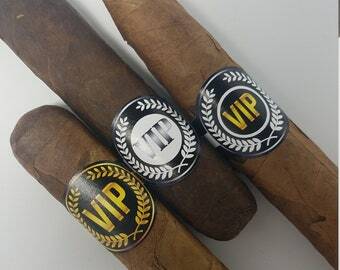 - OPENING MINIMUM ORDER QUANTITY IS 5 of each cigar labels and 5 hand sanitizers. Orders are shipped USPS 2-3 Day Priority w/tracking. Sorry, due to alcohol content, we can not ship hand sanitizer internationally!